My preschooler has been very excited for “Love Day.” He has enthusiastically cut out and decorated many heart cookies with me. it is fun to have this kind of energy in generally, but it is especially helpful when trying many new recipes. These cutie cookies are a breeze to make. They are my traditional shortbread cookie recipe dyed with beet water instead of red food dye. They are dusted with rose cardamom sugar essence and drizzled with chocolate. I keep a jar of rose cardamom sugar essence on hand. It is easy to make up. Perhaps you don’t have edible rose petals on hand, just cardamom sugar essence would be very pleasant too. The chocolate drizzle is chocolate chips melted and mixed with a bit of oil for drizzling. I prefer coconut oil, but you could use whatever cooking oil you have on hand. My little taste testers show their approval. There was a bit of leftover chocolate. I threw together a few chocolates with with caramel sauce in the middle and topped with course sea salt. Yummy little surprises! Buttery cookies dusted with a hint of sweet spice from rose cardamom essence and drizzled with chocolate. In a medium bowl, cream the butter with the first 3 Tbs of granulated sugar. Blend in the vanilla extract and “red food dye”. Mix in all the flour just until dough forms. Press dough out flat. I put all my dough in a gallon ziplock storage bag. Working against the counter surface, I smoothed the dough out into a rectangle about 1/4 inch thick. Cover or wrap the dough and chill in refrigerator for at least 30 minutes. Once dough has chilled you can use a cookie cutter of your choice to make nice shapes. I used a cutter that was just under 2 inches and one that was about 2.5 inches. Place cookies 1-2 inches apart on an ungreased baking sheet. Sprinkle the sugar spice essence over the cut cookies before placing in the oven. Bake cookies for 10-15 minutes just until they set. Allow to brown lightly on the edges. Prepare the chocolate drizzle using a double boiler method. Fill a medium size saucepan a third of the way with water. Bring the water to a simmer. Place a stainless steel mixing bowl over the saucepan. Add in the chocolate chips and melted coconut oil. Stir just until melted. Remove from heat and drizzle directly over the cookies. Place the cookies in the freezer for 15-30 minutes to allow the chocolate to set. Cookies can be store in an airtight container on the counter for 1 week or the freezer for 1 month. *Dairy free & soy free: replace the butter with a soy free vegan option. My favorite is Earth Balance soy free vegan buttery sticks. Replace the chocolate chips with Enjoy Life "Chocolate chips" they a re dairy, nut, soy, and gluten free. I am going to say it now. Sorry, if you are not a fan of Valentine’s Day. I urge you not to click out of this post if you do like cute heart things or the color pink. I can at least offer you that. Holidays are a wonderful excuse to celebrate, decorate, and be generally festive. I welcome the chance to string seasonal garlands, use fun shaped cookie cutters, and make a big deal with the children about an approaching celebration. This Valentine’s day I was looking for a way to avoid red food dye. That journey led me to discovering what foods are naturally red and in season. Beets have made their way into my recent kitchen experiments. My littlest did not like beets as a baby food purée, so all the more reason to find other fun uses. 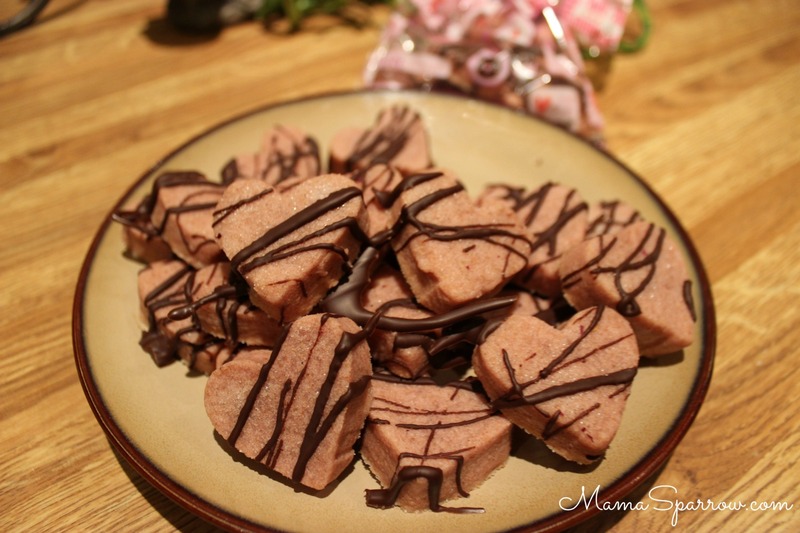 To get the fun heart shaped pattern cookies, make one batch beet shortbread cookies and another batch of traditional shortbreads. Roll each batch of dough out into a rectangle before chilling in the refrigerator. Chill the cookies at least 1 hour. Use a small heart cookie cutter to cut a heart into each cookie and swap out with the opposite colored dough. Proceed to baking as usual and serve you adorable heart cookies with your choice of beverage. I love these with a cup of hot tea. Skip the red food dye. These cookies incorporate the natural coloring from beets. A healthier festively colored cookie. In a medium bowl, cream the butter with the first 3 Tbs of granulated sugar. Blend in the vanilla extract, and beet puree. Mix in all the flour just until dough forms. Use hands to form dough into a log shape. Cover or wrap the dough and chill in refrigerator for at least 30 minutes. Place cookies 1-2 inches apart on an un greased baking sheet. Sprinkle the remaining 1 Tbs of granulated sugar over the cut cookies before placing in the oven. Bake cookies for 10-15 minutes just until they set. Allow to brown lightly on the edges. *Dairy free & soy free: replace the butter with a soy free vegan option. My favorite is Earth Balance soy free vegan buttery sticks. **Beet puree: Wash and peel the beet. Diced into cubes. Place in saucepan and just cover the beet with water. Bring the water with beets to boil. Turn down to a soft, gentle boil. Boil for 10 - 15 minutes until the beet is tender. Drain the water, reserving the cooking water. Run the beets under cold water for 3 minutes to stop the cooking. Place the cubes of beets in a food processor or blender and puree. Black bean and cheese burritos are a quick option for a weeknight dinner. It is as easy as opening a can of beans and cooking up a cup of rice. Brown rice would be the healthiest option. In our home we do half brown, half white. No judging here. You still get points for putting a home prepared dinner on the table. A crowd pleasing entree. This makes for an easy weeknight dinner. Open up the can of black beans. Drain and rinse the beans. Heat up the beans in a small dish in the microwave for 1 minute or over the stovetop for a couple of minutes, till heated through. Set aside. Place a tortilla on a skillet over the range top over medium heat to warm. Remove once just warm enough to be flexible, but before it crisps. Repeat till all tortillas have been warmed. Evenly divide the ingredients over the 4 tortillas. Lift the right and left sides of one of the tortillas, Wiggle the tortilla some between your hands to work the ingredients into a vertical line between the two sides you are gripping. Fold the gripped sides in towards the center - folding 1-1 1/2 inches in. Grip one of the unfolded side and pull across the burrito over the ingredients and began tuck under the ingredients that completes out into rolling the rest of the burrito up. Plate with the fold beneath the burrito.